Honeybee swarm. Close-up of a swarm of honey bees (Apis mellifera) shortly after leaving the hive. Swarming is the method by which honeybee colonies divide, resulting in the creation of an additional colony or colonies. The process is initiated by the queen bee, who leaves the hive along with a large number of worker bees. 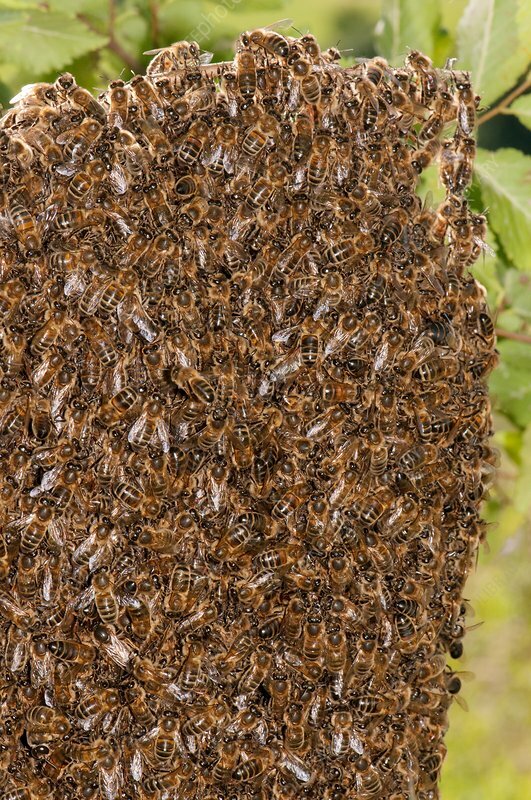 The swarm settles for a short time on a branch or stump, and then departs to form a colony in a new location. Virgin queen bees in the old colony compete to become the new queen. Photographed in the UK.